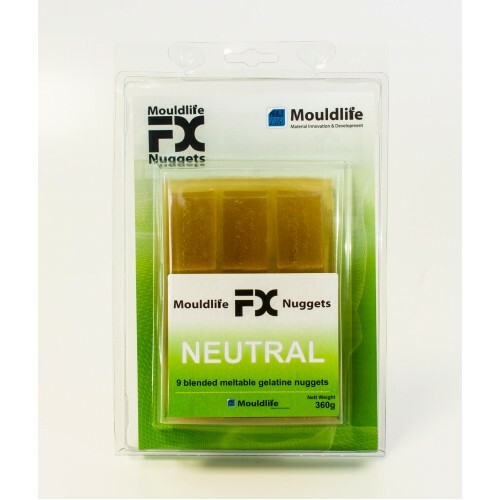 Mouldlife FX Gelatine Nuggets are pre-mixed meltable Gelatine blocks that are gently liquified in the microwave or in a double boiler. Despite the advent of silicone products for prosthetics Gelatine is still a great product that is often used professionally as it is. Economical – there’s very little waste as it can be re-melted and re-used. Often used to ‘test’ moulds that will eventually be used to cast silicone appliances. 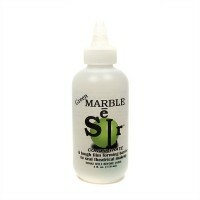 By filling with gelatine you can work out volumes, mould accuracy and filling procedure with the gelatine before commiting to using the costlier silicone. The gelatine pieces can be re-melted and re-poured many times over. 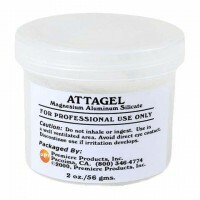 Blending and repairing – edges literally dissolve with Witch hazel and imperfections and tears can be fixed by carefully melting the gelatine. Translucency – Gelatine is as translucent as silicone and is almost indistinguishable from it to the eye. 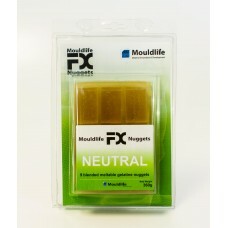 Direct applied – Once melted Gelatine can be cooled enough to remain liquid while applying directly to the skin to create effects such as burns. Be very careful when doing this. Better to heat small amounts in a double boiler with the water below boiling to ensure your artist won’t be scolded. Safety – all the ingredients used in gelatine formulas are either food or medical grades. 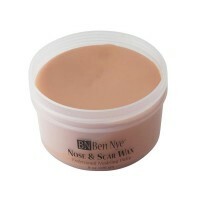 The Nose and Scar Wax from Ben Nye is pliable, yet firm.Wax colors are translucent to resemble skin ..